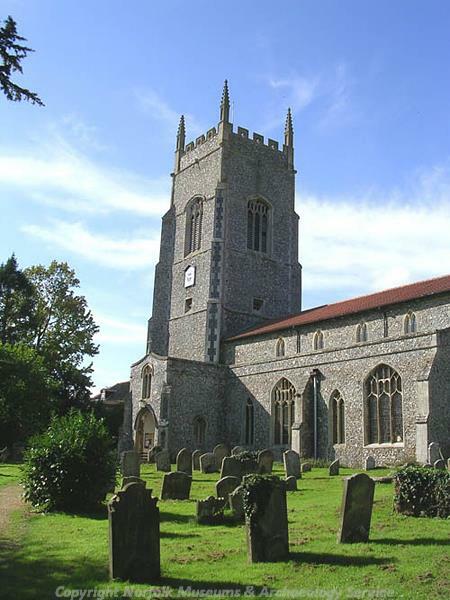 The parish of Saham Toney is situated in the Breckland District of Norfolk. It lies north of Watton, east of Ashill and to the south of Bradenham. Saham Toney means ‘homestead by the lake’ in Old English. However, the ‘Toney’ part of the name also relates to the fact that the land here was owned by Ralph de Toeni, standard bearer of William I, in the period just after the Norman Conquest. The parish has a long history of human habitation and was certainly well established by the time of the Norman Conquest, its population, land ownership and productive resources being extensively detailed in the Domesday Book of 1086. This document reveals that King Edward, and the aforementioned Earl Ralph de Toeni, were the major landholders of the parish. As such it seems to have been an important administrative centre within Norfolk at this time. The earliest evidence of human activity within the parish dates to the Palaeolithic period. The finds from this period include a flint scraper (NHER 8731) and flint flake (NHER 8733). However, the majority of early artefacts date to the Neolithic period and take the form of flint tools such as axes (NHER 8736, 8739, 8741), arrowheads (NHER 14854) and an adze (NHER 4694). A scatter of pot boilers (NHER 8715) north of Dye Farm on Long Road may indicate one possible focus of activity during prehistoric times, but no definite sites are on record. Only a couple of artefacts from the Bronze Age have been found to date. The continuing use of flint for tools is evidenced by arrowheads (NHER 8734) that were found in 1907, but it is at this time that the first metal artefacts appear. 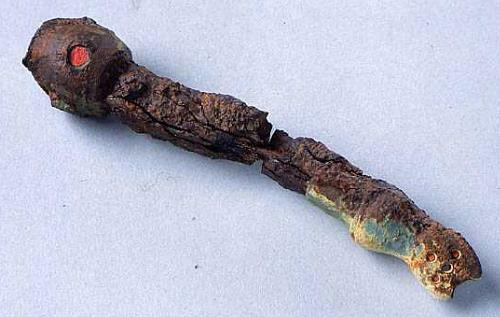 Antiquarians claim to have found a number of swords from Saham Mere (NHER 8743) but this is unconfirmed. However, more accurate recent records report that a Bronze Age sword blade (NHER 31486) and pin (NHER 12615) have been found in Saham Toney. The Iron Age and subsequent Roman period are by far the most significant when considering the history of Saham Toney. The Iron Age and Roman settlement at Woodcock Hall (NHER 4697) has been known since the mid 19th century. Systematic fieldwalking and metal detecting have recovered an enormous number of Iron Age and Roman finds including coins, pottery, building materials and metal objects. The dates of the objects indicate that this was an area of significant settlement from the Late Iron Age until the 4th century AD. The find scatter is widespread between Threxton and Saham Toney. To the south of the stream the number of mid 1st century military finds recovered from a small plateau suggests this is the site of a Claudian fort built to guard the river crossing. The very hot summer in 1996 enabled the identification of cropmarks of a second later fort straddling the Peddar's Way where it crosses the stream. Traces of roads and structures within the large fort can also be seen on aerial photographs. A separate possible annexe or horse compound has also been identified. The fort was the garrison for around 800 Roman legionaries and cavalry and was probably built in the second half of the first century AD on the site of an earlier Iron Age site. It may have been constructed in response to the Boudican revolt. 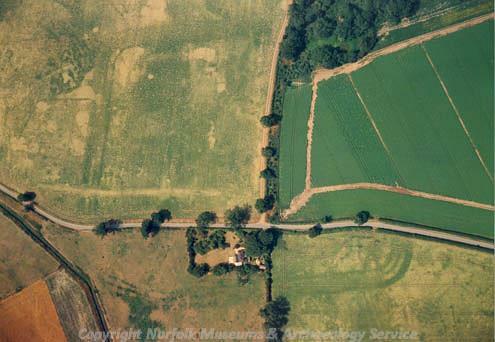 Another Iron Age to Roman period fort site has been identified at High Banks through analysis of earthworks visible on aerial photographs (NHER 8745). However, finds from here are somewhat limited and consist solely of pottery sherds. A Romano-British settlement site (NHER 29429) is also recorded at Quidney Farm. Metal detecting at this site in 1992-93 recovered a number of important artefacts including terrets, axes, manacles, a griddle, brooches, coins and pottery sherds. Further archaeological investigations in 1995 noted ditches, gullies, post-holes, cobbled flooring and building remains and metal working debris. This evidence suggested significant occupation and metal production. Of course many other Iron Age objects have been discovered across the parish including terrets (NHER 31685), studs (NHER 32967 and 32970), pommel rings (NHER 25146), brooches (NHER 12615) and coins – including one minted by the Trinovantes tribe (NHER 34324) who were based in Essex. This wealth of archaeology would tally with the theory that Saham Toney was a power centre for the Iceni tribe during this period. It also seems likely that Saham Toney was the hub of a trading zone for Iron Age goods, and the finds that have been recovered certainly support this notion. The prosperity that resulted from this manufacture and trade continued into Roman times as two settlement sites have been discovered. The larger one (NHER 8747) lies to the southwest of Saham Wood and was identified by the concentration and pattern of artefacts, most of which were found by metal detecting. The other site (NHER 31226) is situated to the south of Mere Farm and was uncovered by ploughing in the 1950s. Here, the remains of four buildings and numerous finds including coins, lead weights, stirrups and brooches were uncovered. Additionally, a vast collection of Roman objects has been recovered from Saham Toney and these range from quern stones (NHER 8708) and lead weights (NHER 32800) to toilet implements (NHER 30947) and seal boxes (NHER 31685). A possible Roman road (NHER 8714) also runs through the parish, which would have enhanced the communications network of this thriving town. Compared to the previous periods relatively little evidence of Saxon activity has been recorded. Saxon artefacts found at Woodcock Hall (NHER 4697) may suggest that occupation here was maintained at some level. Otherwise all the remaining evidence from this period takes the form of small finds. The most interesting of these comprise a spangle (NHER 35636) for enhancing the appearance of clothing, an iron spearhead (NHER 31694) and a decorated bridle cheek-piece found to the north of Hill Farm (NHER 32020). The discovery of an Early Saxon cremation urn in Threxton during 1850 may suggest that a cemetery was located here but the lack of information about the urn has made finding such a site impossible. The medieval period saw the construction of St George’s church (NHER 4696). This large, handsome building dates mainly to the 13th-15th centuries but underwent numerous alterations in the 19th century. Architectural features of interest include the huge belfry windows, Norman priest's door to the chancel and carvings around the west door of the patron saint fighting the dragon. The interior is particularly fine and includes a remarkable 15th century pulpit, delicate 13th century arcading and a beautifully carved wooden top to the modest 15th century font. However, this was not the only place of worship during medieval era. Little St Andrew’s chantry chapel (NHER 30586) was founded in 1281 to serve Wendling Abbey. It also functioned as a church for the local populace until its demolition during the Dissolution. It has also been reported that another medieval chantry chapel (NHER 39464) existed in Saham Toney, but the site of this chapel has never been found. Aerial photographs taken in 1946 have helped to identify remnants of tofts and the medieval village green (NHER 29689) to the north of the houses on Chequers Lane. It also seems that Saham Toney had a deer park (NHER 14158) in the medieval period located somewhere in the vicinity of Park Farm. Sadly, transcribing the exact location of the park from the 16th century map to the modern Ordnance Survey has proved impossible. However, evidence from the Domesday Book does show that there was a thriving farmstead at Page’s Place (NHER 23739) in 1086. This information is not immediately apparent as the building currently standing here dates to the 16th/17th century and is noted for its elaborate entrance porch with Doric columns. At this point it would be remiss not to mention a few of the finer medieval artefacts that have been found in the parish. These objects comprise a rectangular pilgrim badge fragment showing St Paul brandishing a sword (NHER 28496), a casket mount with a fleur-de-lys set against a blue enamelled background (NHER 31863) and a lead seal matrix engraved with two facing busts with a bird sat between them (NHER 35769). Any readers who desire a more comprehensive list of medieval finds should access the numerous individual records held for these. The town of Saham Toney seems to have been a thriving place during the post medieval period. Several windmills have been recorded in the parish (NHER 8787, 8790, 15264, 15265 and 15266) at this time, with the hilly landscape providing an appropriate setting for these structures. We have the most information on the tower mill (NHER 15264), which was built in 1826 before being rebuilt in 1960. When the mill was converted to a private dwelling, the cap was replaced by castellated brickwork and the tower was given an off-white pebble dash finish. By 1981 single storey rooms had been added around the base of the tower. In addition to milling Saham Toney was involved in lime burning (see NHER 15245 and 15957) and brick production (NHER 8744). The early turnpike road running from Watton to Dereham (NHER 8791) that was built in 1740 would certainly have helped with the transport of goods to and from the town. As one would expect, many fine residential buildings of this period exist in the parish. For example, visitors who stroll down Richmond Road can observe the Old Rectory (NHER 46199) and White Hall (NHER 46200). Both of these pleasingly sturdy brick-built houses date to the 18th century and represent typical dwellings for the affluent. The Old Rectory also has an associated historic park (NHER 30599), which was formed sometime prior to 1797. It is unfortunate that Saham Hall (NHER 4712), one of the grandest buildings, burnt down in 1960 with only a small portion of it left as a consequence. The mansion here was originally erected in 1800 but was rebuilt in 1904 in the Queen Anne style, which would have made it an impressive building had it survived through to modernity. A number of eccentric individuals appear to have lived amongst the pious population of Saham Toney at this time. Thomas Shuckforth, a local gentleman, decided not to be buried in the churchyard but instead selected a plot on the land now known as Burying Ground Green. His tomb (NHER 15267) was an elaborate affair with stone statues and carvings, but no trace of his desired place of rest remains here now. Another burial of an unusual nature is situated at the crossroads at Mill Corner. A man who committed suicide was buried here at sometime around 1790 (NHER 13171). It is reported that he had infuriated local people by pouring beer and wine into the river and was subsequently driven out of the village. With no place to go, the depressed man took his own life! An eccentric clergyman also built a commemorative monument in the shape of a Greek altar in the northwest corner of Rectory Park (NHER 30599). The most recent period covered by the archaeological records of the parish is World War Two. It seems that Saham Toney was an unhappy place for pilots at this time as three aeroplane crash sites have been identified. In 1944 an American B-17 Flying Fortress bomber crashed near to Saham Wood after breaking up in mid air (NHER 19201). In the same year a Mosquito B mk IV aeroplane on a reconnaissance flight crashed (NHER 19357), costing the lives of the entire crew. The other crash site lies to the northwest of Saham Waite (NHER 28796) and concerns a British aircraft at an unknown date. The only World War Two structure on file is an anti aircraft gun battery (NHER 31917) in the area known locally as ‘The Bombing Ranges’. This was identified through cropmarks visible on an aerial photograph taken in the early part of 1946. However, subsequent aerial photographs show that ploughing in the latter part of 1946 had destroyed the site. Thomas Sunley (NLA), 21 February 2007.